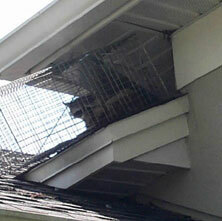 Here is a raccoon captured in a roof-mounted system under a dormer soffit. Raccoons are expert climbers, and will often climb onto the roof of a home. Sometimes they do this as a matter of exploration, but most of the time they have a more sinister purpose... they are in fact entering your attic! They often climb onto the roof and push open an area of soffit in order to gain access to the attic. In order to solve the problem, a trapping professional can set a trap to remove the animal. Sure, the trap can be set on the ground, but that runs a risk of catching a non-target animal. If you want to be sure to catch the exact culprit, set the trap right at the entry point. In fact, if you want to be really sure, set it so that the animal has no other option but to enter the trap upon emerging from the attic. There's a few things to keep in mind when setting a trap on a roof. First of all, it should be bolted down. However, you don't want to cause roof leaks, so bolt it to fascia boards if possible, or be ready to plug the screw holes properly. Second, trapped raccoons tend to grab everything in reach, and will often tear up roof shingles. Line the area below the trap with 1/4 inch hardware cloth or some equivalent to prevent this. Third, please realize that in many cases, the raccoon in the attic is a mother with pups, and trapping her alone does not solve the problem. You need to be sure to remove the pups as well, preferably at the same time if you plan to relocate them (if that's legal in your state, which it is here in Florida). You can't leave baby raccoons alone in an attic to die, it's inhumane and it causes an odor problem for you. Also, keep in mind that a roof can be a dangerous place on which to work. Please don't attempt to trap raccoons on the roof yourself - this is the domain of professional wildlife control experts. Raccoon on the Roof: One of the most horrifying thoughts is that there is raccoon on the roof of your house and you have no way to get rid of it. But have you ever thought that what brought the raccoon up to the roof in the first place? Probably the raccoon must be looking for a cozy place to settle in most likely that place to be your attic or probably it has found some food to feed its hungry stomach. Whatever may be the reason, the only thing on your mind would be to get rid of it and prevent it from entering your attic or any other part of your house. Here are a few tips to get the raccoon off your roof and avoid for more to get on it. If the raccoon is right up and is visible on the roof, to bring it down, put a little food down on the ground. This may lead the raccoon towards the food hence bringing it down and ultimately run it off out of your house. Scare the raccoon off. Use a water sprinkler or an automatic sprinkler on the raccoon to scare it away. This way is one of the most effective ways to get rid of the raccoon perched on your roof. 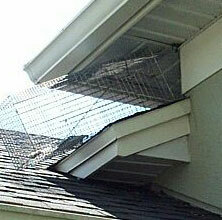 Set traps all along the roof so that even if a raccoon gets on the roof it gets trapped and you catch it easily. If there is a tree with long braches in your shed or garden, trim those branches that lead to the roof. Raccoons are excellent climbers and these long branches are surely a good passage for them. The most evident reason for a raccoon to be on the roof is because it has found itself a comfortable place to settle in. To avoid it from making your attic its home, clean up your attic and throw or give away all unnecessary items to keep the raccoon from making a cozy place amongst your stuff. Clean your roof and fix up any broken area on the roof. Raccoons are capable of causing a lot of damage. If you see and signs of forced entry fix that patch to avoid further raccoons from entering in. Avoid leaving any trail or crumbs of food anywhere near the roof. Once the raccoon knows that it is your roof where it will find food then the raccoon will visit again and again to devour on the food you left. However, if none of this is helpful and you still see raccoons coming in via your roof then you can call at any of the agencies for professional help who can do this work for you. The agency will send the animal control officer to catch the raccoon and put it away to the place where it is actually meant to be.